Thank you and welcome for visiting the new Internet home of the Transvaal Meccano Guild. 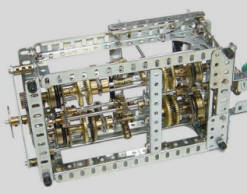 This site is published by the TMG with the aim of uniting individual Meccano modelers and interested parties, to promote and encourage the enjoyment of Meccano. At present, our new web site is still under construction. We are making every effort to get this site up and running as soon as possible, so please be patient and visit often to see new content. At this point we can provide you with basic contact information and information regarding forthcoming Meccano Shows and TMG meetings. No material from this WebSite may be reproduced or published in any form for public use without the permission of the Webmaster. If permission to reproduce or publish is granted, then full acknowledgement of the source must accompany the material. If you feel any material used on this site is subject to copyright then please contact the Webmaster and it will be removed.